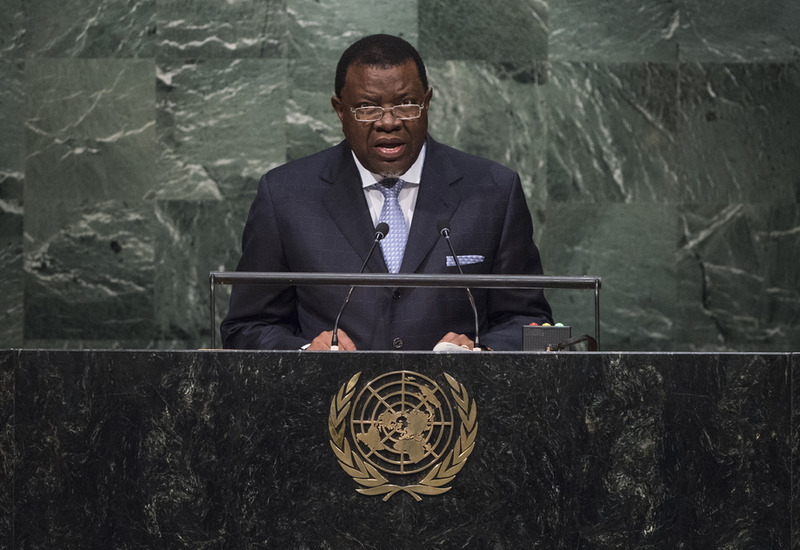 HAGE G. GEINGOB, President of Namibia, said his country was “a child of international solidarity, midwifed by the United Nations”. Following the termination of South Africa’s mandate over then South-West Africa, the Organization had assumed direct responsibility for Namibia, establishing a Nationhood Programme and an Institute for Namibia to develop the building blocks for democracy. Citing an African proverb, which said that a “patient man will eat ripe fruit”, he announced that Namibia was now eating the ripe fruit of peace and democracy. In gratitude to the international community, he noted the country’s contributions to United Nations peacekeeping operations since independence. Celebrating United Nations successes over the last 70 years, he noted that conflicts of the magnitude of the two World Wars had been averted and that, most importantly, inroads had been made to lifting millions out of extreme poverty, empowering women, advancing human rights and spearheading the decolonization process, which was nearly complete except for the situation of the Saharans. Africa had turned over a new leaf, ostracizing those who had assumed power unlawfully, and commended the many that had achieved electoral democracies. Namibia’s own track record “spoke volumes”; it was rated sixth among best governed countries in Africa by the Mo Ibrahim index of African governance; the seventh lowest in corruption; and had the freest press in Africa. The country also had a world-class banking system. However, the challenges of social disparities, such as housing and other basic necessities, remained unmet. The distribution of wealth was too important to be left solely to the international financial institutions, he went on. Classifying countries by gross domestic product (GDP) alone ignored inequalities in wealth distribution, as well as opportunities. Namibia was a casualty of that approach. Classified as an upper-middle-income country, the legacy of apartheid, which left wealth in the hands of the white minority, had not been taken into account. The country was denied access to grants and concessional loans to support its development agenda, leaving the poor trapped in perpetual cycles of poverty and despair. He further stressed the importance of empowering women to combat poverty, as Namibia had done, increasing female representation in Parliament to 47 per cent and naming women ministers in a number of strategic ministries. He reaffirmed support for the inalienable rights of the people of Palestine and Western Sahara to self-determination and national independence, and called on the Organization to implement all resolutions on Palestine without pre-conditions, as well as texts calling for a free and fair referendum in Western Sahara. He commended the re-establishment of diplomatic relations between Cuba and the United States and looked to the lifting of the embargo. Committed to comprehensive United Nations reforms, he supported the African Common Position. Poverty would not be eliminated without tackling the issues of desertification, land degradation and drought. As President of the eleventh Conference of the Parties to the United Nations Convention to Combat Desertification, Namibia sought to strengthen its implementation and was pleased that the issues were included in the Sustainable Development Goals. The only way to overcome global challenges was through a united front for the advancement of mankind. “Let us leave a long lasting legacy, which will shape the future of our planet politically, economically and ecologically,” he concluded.